An inventive and deadly arsenal of weaponry is at the heart of any great action game, and Assassin’s Creed Odyssey has a whole lot to choose from. Here are some of the best weapons in Assassin’s Creed Odyssey that we’ve found so far. We’ve included tips for all levels of the game, so you can dish out the damage from day one. 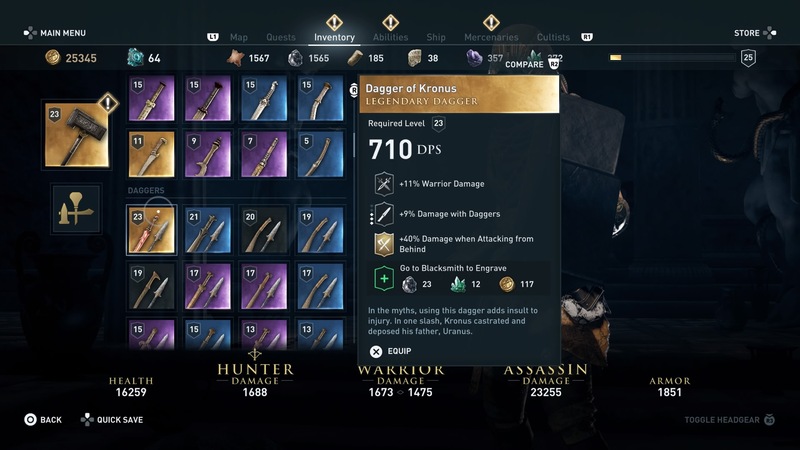 Assassin’s Creed Odyssey is quite malleable with how it lets you equip Alexios or Kassasndra. When you find a powerful Legendary item, you unlock its engraving, so if you find a different weapon you really like – but there’s an ability you can’t do without – then you can just add it to your favourite sharp object. 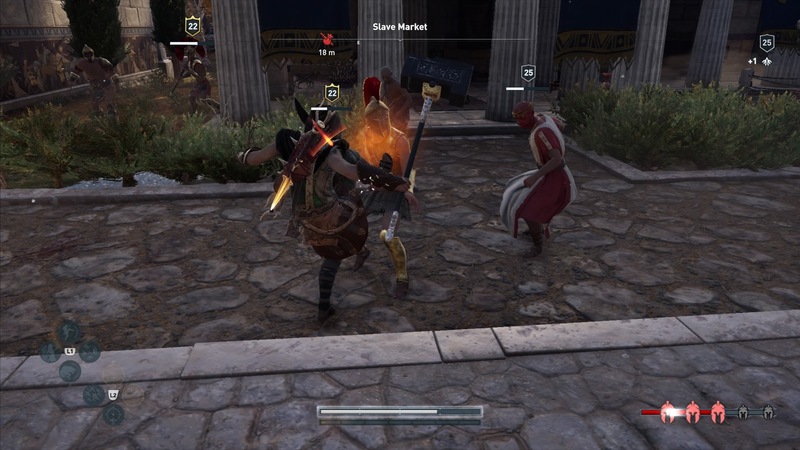 In Assassin’s Creed Odyssey, you have two weapon slots: melee and ranged. As you progress through the game, you’ll unlock a second melee weapon slot too. There are four rarities of weapon that you can find throughout the Classical Greek World: Common, which are black, Rare, which are blue, Epic, which are purple, and Legendary, which are golden. All weapons have a “DPS” stat, which determines how much damage they do. Legendary and Epic weapons have the strongest DPS relative to their level and also give you the most stat boosts. Common weapons give you one boost, Rare ones give you two, and Epic weapons give you three. Legendary weapons also give you third, but the last one is a golden unique ability. Once you find a Legendary weapon, you unlock its Legendary Engraving, which means you can give its golden perk to any other weapon. 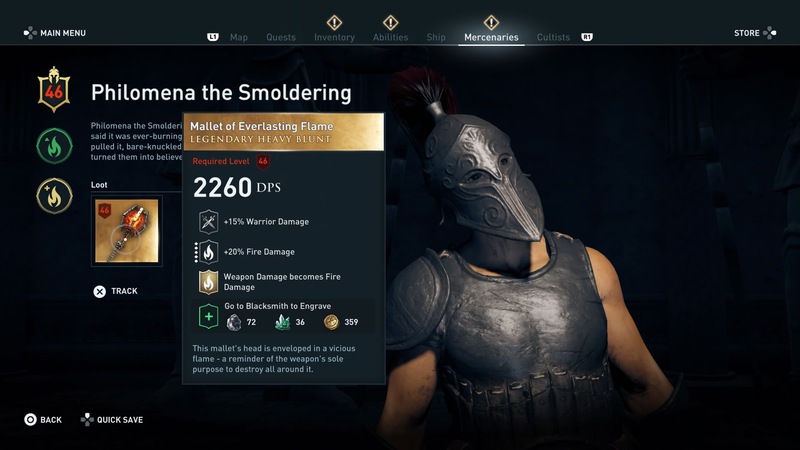 Throughout most of Assassin’s Creed Odyssey, you’re going to be chopping and changing between different weapons as you progress through the levels. Any gear that you come across is going to be quickly outclassed by higher level equipment, which means you’ll always be finding new stuff to use. It’s not cost-effective to keep upgrading things at the blacksmith, so try not to get too attached. On Kephallonia, during the Spear of Kephalos quest that you get from the Temple of Zeus in Sami, you can lie to the priestess once you’ve retrieved the spear from Melissani Cave and say that it wasn’t there. This means that you can keep the Spear of Kephalos, which is a Rare level item. This is super early to get hold of one, so you could keep hold of it and upgrade it for a while. To get a strong legendary bow once you reach Phokis, head north to the Temple of Artemis. Here you’ll meet Daphnae, who’ll send you to kill the Kalydonian Boar. It’s a tough fight – which we’ve done a whole guide page for – but once it’s done you’ll get Artemis’s Bow which buffs your Bow charging speed and Predator Shot Ability. When you get the ability to go to Argolis, make your way to the northeastern area – the Palace of Agamemnon. In the west of this area you’ll find a fort called Mycenae. Inside of the Legendary chest in this fort you’ll get your hands on the Hammer of Jason. It’s a quality heavy blunt with an awesome golden perk: +20% damage with the Shield Break ability. It’s worth grabbing for the engraving alone. There are loads of rare and powerful weapons with exceptional abilities for you to uncover throughout your journey. 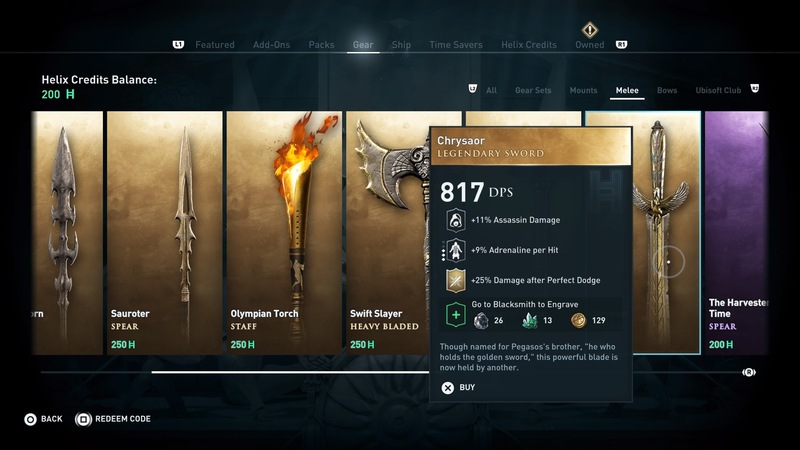 And because of Assassin’s Creed Odyssey’s Engraving system, once you’ve found a weapon type you like, you can add powerful buffs to its skillset, even ones that start off as unique to Legendary items. A strong place to start is with the Pegasos set sword: Chrysaor. This Legendary sword has the golden perk of +25% damage after a perfect dodge, which by the late game hopefully you’ve gotten pretty good at pulling off. 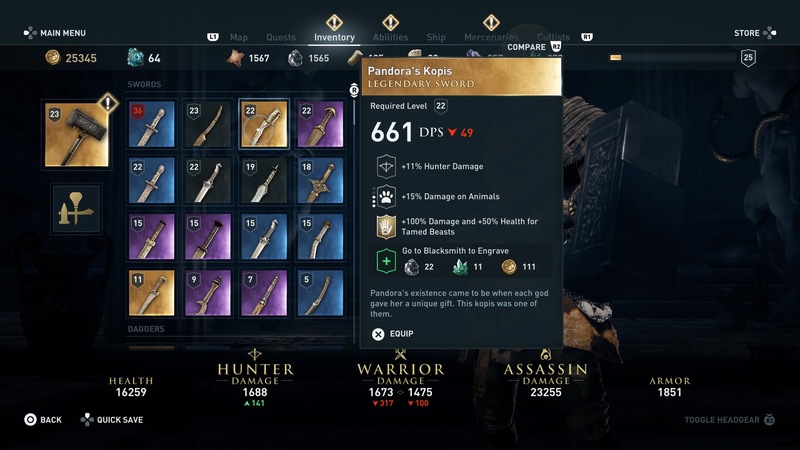 An interesting weapon is Pandora’s Kopis, which you get from killing the Nemean Lion. It’s Legendary perk is +100% damage and +50% health for Tamed Beasts, which opens up a whole new playstyle based around that character ability. Another strong weapon is the Dagger of Kronus, which deals +40% damage with attacks from behind. Being a sneaky assassin, this happens quite a lot. For a less subtle approach, try the Mallet of Everlasting Flame. This behemoth heavy blunt deals all weapon damage as fire damage – and well as boosting your fire damage by 20%. The Minotaur’s Labrys that you get after collecting the Minotaur’s artefact comes with an extremely powerful engraving, which makes Overpower Abilities cost one less Adrenaline segment. Overpower Attacks are really strong, especially for getting your health back against bosses, so getting to use them more often is probably one of the best engravings in the game. And last but not least is the Gorgoneion Xiphos, which has the unique ability of “Low chance to Stun on melee hit”. Combined with the quick attack speeds of a sword or dagger, this can end up helping out more than you think. For ranged users, a fun weapon is the Fanged Bow, which comes with an engraving that turns normal arrows into poison ones – meaning every shot builds up toxicity on an enemy. A great passive skill to add to any bow you like. We found it in the Cave of Mt. Zas, behind a statue at the end of the cave, on Naxos.